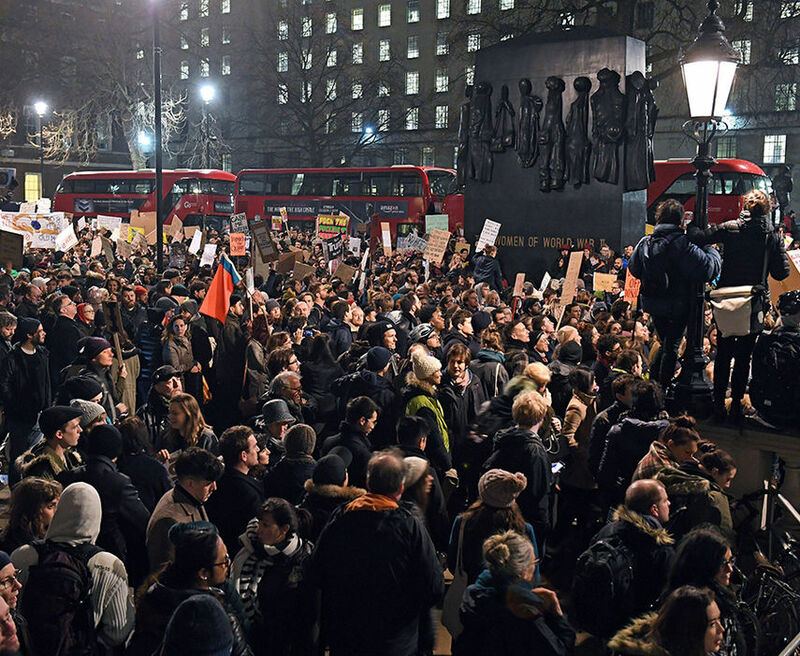 People demonstrate during a protest at Downing Street in central London against US President Donald Trump’s immigration ban. The UK has spent the past half-century balancing two primary foreign policy commitments: its membership in the European Union (EU) and its ‘special relationship’ with the United States (USA). Primed and ready to pull the trigger on Article 50, However, Britain seems to be leaning hardest on its American ally at the worst possible time – after the election of President Donald Trump. Brexit supporters feel validated by President Trump’s support for the country’s exit from the EU, while others worry about his strong “America First” policy. What does this mean for the future of this historic Anglo-American relationship? Political commentators stand at the ready, critiquing every speech, meeting and tweet coming out of Washington, while UK leaders are forced to play a torturous waiting game. This is a special relationship, indeed. While some may have once cast Britain as the Greeks to America’s Romans, such a parallel would require some form of veneration for the ailing UK – and Trump has little interest-holding vigil for anyone. His policies and decision-making patterns are proving hard to predict. Nevertheless, both sides seem to have renewed their support of the special relationship. No one is more dedicated to this cause than Prime Minister Theresa May, who seemed to have hurled herself towards her American ally by extending an invitation to the UK in January to welcome President Trump into office and to reaffirm the relationship. Many, including Trump, have been quick to draw a parallel between the close relationship between President Ronald Reagan and PM Margaret Thatcher and future relations between President Donald Trump and PM Theresa May, suggesting that leaders of the two countries will work together quite closely. While Trump may enjoy the historic romanticism of calling May ‘my Maggie’ for now, he is also keenly aware of the position in which he sits, and that May has very few cards to play. Those she does have may just turn out to be irrelevant to his future plans. Traditionally the US-UK relationship has been maintained between presidents and prime ministers. Trump may choose to change the rules of this game, as we have already seen him engaging and collaborating with other UK political figures ahead of the PM, such as conservative MP Michael Gove and former UK Independence Party leader (UKIP) Nigel Farage. Farage, in particular, has developed a bond with Trump and other American conservatives. He was even invited to speak at this year’s Conservative Political Action Conference where he was greeted with a standing ovation. During his campaign, Trump supported Farage and UKIP’s campaign for Brexit. President Trump has been quick to set the tone of his administration – ‘America First’. His definition of what ‘America’ includes seems to be highly selective. His controversial executive orders have made quick work of overturning the more liberal initiatives championed by President Obama. Both Brexit and Trump’s election seem to have given a voice to right-wing movements across the world. Some have highlighted that pledging close alliance with the US sends a dangerous message. Rallies, marches, petitions and debates are being held worldwide rebelling these shifts occurring in these ‘liberal’ democracies. Potentially his most controversial order on immigration, now dubbed the “Muslim Ban,” regardless of its legality, puts Britain in a difficult position. Trump’s views on immigration stand in direct opposition to those of German chancellor Angela Merkel. Aligning too closely with Trump may sever any remaining ties or chances at negotiating new agreements with EU leaders. At present, Britain runs the risk of standing too close and getting scorched by Trump’s options or standing too far and being cast out into the cold. Trump presented a renewed sense of hope for strengthening trade relations with the UK in contrast to Obama’s position that the UK would be at the ‘back of the queue’ following Brexit. Theresa May seems determined to make things work, while also attempting to keep Trump somewhat in check. The US and the UK worked very closely to impose sanctions on Russia following the annexation of Crimea, and maintain a ceasefire between the Ukraine army and pro-Russian rebels as part of the Minsk Agreement. However, Trump has stated that he could consider doing a deal with Russia, which would result in the lifting of sanctions. May was quick to denounce the idea during their joint press conference at the White House in January, supporting the continuation of sanctions until full implementation of the Minsk Agreement is achieved. Additionally, during the press conference, May suggested that Trump has reaffirmed his dedication to NATO, which he had previously referred to as ‘obsolete’. Trump’s views on the NATO partnership worry many in the alliance, particularly when it comes to honouring the agreement in reference to Russia. Trump’s recent proposal to increase the US defence budget spending by almost ten per cent will also result in some benefits for NATO. With incremental spending cuts on the UK’s own armed services, the UK would be wise to maintain its longstanding relationship with US armed forces and keep them as their closest military ally. The future of this special relationship will probably remain vague until the triggering of Article 50 and the UK is formally in a position to negotiate bilateral trade agreements. But until then, it is hard to map out the future of this relationship. By then, Trump may have found a new best friend – be it Russia or another power. At the same time, the legitimacy of Trump’s administration seems to be challenged on a daily basis, with reports of pre-election backroom chats and corrupt advisors shaking the legitimacy of his administration. As Trump proves to be a volatile force, Theresa May must remain vigilant for now. It is her hand that must steady the rudder of this special relationship. Christina Dutton(@cbdutton111) is pursuing an MA in Intelligence and International Security at King’s College. She received her undergraduate degree at the University of St Andrews in International Relations, and works at a consultancy in the City of London providing research and risk assessment. This Strife series focuses on British Security Post-Brexit and will have contributions by Dr Samir Puri; Felix Manig on the security implications of post-Brexit asylum laws; Christina on the UK-USA relationship; and Alfonc Rakaj on British defence commitments.